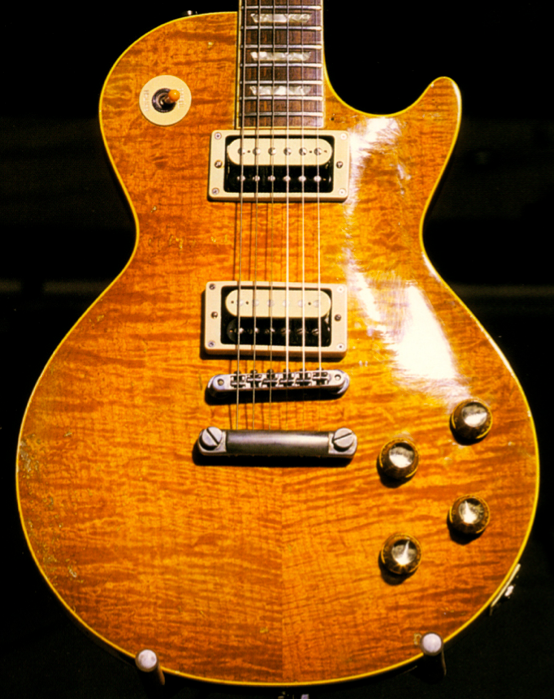 While appearing to be an actual Gibson Les Paul, the guitar Slash used in Guns N' Roses to record the classic album "Appetite For Destruction" was actually a replica of a 1959 Les Paul built by LA luthier Kris Derrig at MusicWorks in Redondo Beach in May of 1986. Purchased for Slash by Guns N' Roses manager Alan Niven, it featured a fat 1958 neck profile, a flamed maple top and a Honduran mahogany neck and body. Coupled with a rented Marshall 100 watt amp, it was the foundation for the iconic Guns N' Roses guitar sound.